Richard Price was born in 1966. His father was a manager in the construction industry, first with Laing and then at the Scottish Special Housing Association. The Association was said to be the largest builder of council homes in Europe: it was aggressively dismantled in the early years of the Thatcher government, when Price's father was made redundant. Price's mother worked at home, raising four sons. She had attended art college in Kent in her teens and managed, sometimes, to find time to paint for pleasure. At the age of seventeen Price trained as a journalist at Napier College, Edinburgh. He then studied English and Librarianship at the University of Strathclyde, Glasgow. 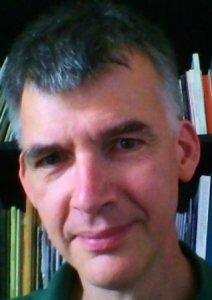 In 1988 he moved to London to work at the British Library, completing in his spare time a PhD concerning the novelist Neil Gunn's political and aesthetic response to the tragic. For many years Price was a curator at the British Library and then the head of the curatorial department Modern British Collections. This section later disappeared in an internal reorganisation: while there he curated Migrant and the Possibility of Poetry, an exhibition which highlighted Gael Turnbull's role in the American, Scottish and English networks which primed and catalysed the British Poetry Revival of the 1960s and 70s (and the parallel re-emergence of the artist book in the UK). He also co-developed and judged the Michael Marks Pamphlet Awards, attempting to re-set and widen the aesthetic terms of poetry's reception within the conventional prize infrastructure. After working for four years in a strategy unit at the Library he returned in 2014 to curatorship as Head of Contemporary British Collections, the department responsible for the Library’s sound archive, web archive, contemporary manuscripts, and contemporary legal deposit publications. In the 1990s Price had been associated with the group of poets the Informationists, coining the name. It remains one of the few UK groupings since the Second World War to name and identify itself collectively, to establish its own publishing and reviewing network (for example, via such magazines as Verse and Gairfish) and to publish a group anthology with manifestos (Contraflow on the SuperHighway, 1994) . Aiming to import more 'non-poetic' ideas into poetry and to challenge the hierarchies inscribed in the language of political systems (including academia), Informationism can be seen in part as continuing the late modernist and social programme of the poet Edwin Morgan. At this time Price co-edited Gairfish, Verse, and Southfields, and co-founded Vennel Press, which published early books by David Kinloch, Elizabeth James, W. N. Herbert, Donny O'Rourke, Peter McCarey and others. He now edits the little magazine Painted, spoken. His collections include Lucky Day, Greenfields, and Rays, and as R. J. Price he has published a novel, The Island. His collection Small World (Carcanet, 2012) won the SMIT Scottish Book of the Year Award in the poetry category. In 2013 he was European Poet in Residence at the University of Coimbra, Portugal. Recurrent themes in his work include the complex nature of disability (in large part a result of his experience as a father whose daughter, Katie, has Angelman's Syndrome); and the relationship between intelligence, the lyric (in song and in poetry) and love. His work ranges across a large stylistic and tonal spectrum but he has positioned himself as "a writer of modern lyric poetry in the sense, say, that Denise Riley or Kelvin Corcoran, I believe, are." He often works with artists in other media, including Simon Lewandowski (digital and conceptual), Karen Bleitz, Ron King, and Julie Johnstone (artist's books), David Annand (sculpture), and Caroline Trettine and Ian Kearey (music). His website is hydrohotel.net, where Painted, spoken is available in digital form and where Price's literary criticism is collected. This recording was made on 29 January 2007, at a house in Stamford Hill, north London. and it’s just between you and no-one in particular, a value one-to-one. so multiply. Still no quench. Sensation consumption, max and no check: where’s that exteriority heading? Para-diagnose and park it, self-drug. In any case, less self, thanks, and a quest for structures of the collective. I know, the good future’s old-fashioned. Belonging to sharing needs activation. It doesn’t scratch a plan for let’s get off this planet. There’s so much space, together. A fine car pursuit, screech of post-production. Keep going. They’re close, gaining. a liquid air acceptance, that kind of government. grab yourself a leg-up, grip justifies grasp, use your stealth, hot royalize. Can this weight, this velocity be used? It doesn’t start with choice, with unit of “you”, how any one might feel. Privilege polices the pre-sets , trumpets its come-the-innocent equal opportunity / “just join-in” . aggrandised gangs hoarding elegance and “give the hordes a kicking, example serves”. Etch a plan for let’s get off this planet. There’s so much inner space, out there, together.